The 200mph Bentley | What Car? Bentley has revised its Continental Flying Spur saloon, and there's now a Speed variant that's capable of 200mph. The new Flying Spur Speed is powered by Bentley's twin-turbocharged 6.0-litre W12 engine that's also used in the GT Speed Coupe. 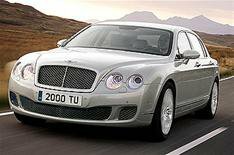 It has 600bhp, which is 48bhp more than the standard car, and pulling power is up by 74lb ft to 553lb ft.
Bentley claims the Flying Spur will hit 60mph in 4.5 seconds from rest, and 100mph after 10.5 seconds. Subtle styling tweaks distinguish the Speed from the standard Flying Spur. The more powerful car gets its front grille and lower air intakes finished in dark-tinted chrome, as well as a new design of exhaust tailpipes. The Speed's power steering has also been retuned, and the suspension has been lowered. The standard Flying Spur has also been revised, with some mild visual changes, better noise insulation and the option of adaptive cruise control and a new Naim audio system, which includes an 1100-Watt amplifier.